Lynn Cline is the author of The Maverick Cookbook: Iconic Recipes and Tales From New Mexico, published in 2015 by award-winning Leaf Storm Press in Santa Fe. Her first book, Romantic Days and Nights in Santa Fe, an illustrated travel guide, was published in two editions (1998 and 2000) by Globe Pequot Press. For more than a two decades, Lynn Cline has written about literature, fine art, performing art, film, music, New Mexico history, travel and food for a host of publications, including The New York Times, Ploughshares, A Literary Journal, Sunset, Publisher’s Weekly, Women’s Health & Fitness, Bon Appetit, Film & Video Quarterly, New Mexico Magazine, The Santa Fean, and Santa Fe Trend. For more than a decade, she served as the The Santa Fe New Mexican’s food editor, restaurant reviewer, literary editor, and staff writer reporting on arts and culture, music, performance art, travel, the outdoors, politics, daily news, historic houses, real estate, and art and culture. 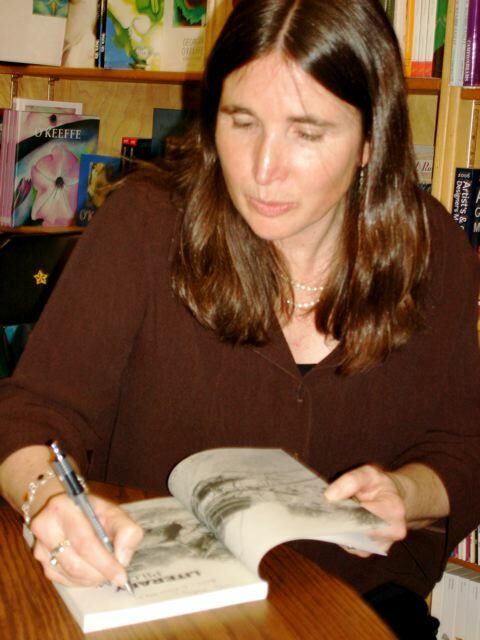 She has written the introductions for a series of books about historic Santa Fe, including novels, non-fiction, essays and poetry for Sunstone Press’s Literary Heritage Series, including: Mabel Dodge Luhan’s Winter in Taos; Marta Weigle’s Santa Fe and Taos: The Writer’s Era: Raymond Otis’s Fire in the Night; Erna Fergusson’s Murder and Mystery in New Mexico; and Edwin Corle’s Burro Alley. She’s also written a foreword for a forthcoming Sunstone Press anthology of essays and articles written by Dorothy Pillsbury, whose articles first appeared in The Christian Science Monitor, Reader’s Digest and other publications before the University of New Mexico Press published them in a series of four books, beginning with No High Adobe in 1950 and followed by Adobe Doorways (1952), Roots in Adobe (1959), and Star Over Adobe (1963). Lynn Cline was hired by world-renowned guitarist, composer and musician Ottmar Liebert to write the foreword to his book, Ottmar Liebert: Nouveau Flamenco, published by Creative Concepts. She also was hired by acclaimed New England artist Henry Isaacs to write a forthcoming book about his life and art. Lynn Cline’s articles on literature and photography have won awards from the New Mexico Women’s Press Association. She also has served as directing judge for the annual regional Mountains & Plains Book Award in fiction, as well as for the Zia Award in children’s books, presented annually by the New Mexico Women’s Press Association to a New Mexico woman writer. Her lecture, “Willa Cather in the Southwest,” was a featured event at the Santa Fe Festival of the Book and at New Mexico Highlands University’s symposium on New Mexico Literature. “Fertile Ground,” originally a lecture on New Mexico’s literary history presented at the annual New Mexico Book Association’s conference, has been published in the most recent New Mexico’s Book World: A Resource Guide. Lynn Cline has taught writing courses at The Santa Fe Community College and at the college’s annual writer’s conference. Lynn Cline also worked on staff for the Associated Press as a cub reporter covering the presidential campaign in 1984 from Des Moines, Iowa and then, for three months, in AP’s Miami office. In New Mexico, she continued a stint with AP covering the 1995 New Mexico Legislative session. Lynn Cline was born in Sweden and grew up in Princeton, N.J. She moved to Santa Fe in 1993, where she lives with her husband Kyle Langan ~ one of the owners Studio X, a Santa Fe-based web design company with hundreds of clients around the world. She holds a master’s degree from Middlebury College’s Bread Loaf School of English; a bachelor’s degree in English, Communications and French from the University of Vermont; and undergraduate credits from the Sorbonne Université in Paris. Lynn Cline speaks fluent French, is a classically-trained pianist, flutist and guitarist, and a professional singer of classical and contemporary music, including her own compositions she has performed in various venues in Princeton, NJ and Santa Fe.